Luckily I had some help this past Fashion Week from my co-workers, Sarah and Lindsey. Many grateful thanks to them! Below is Sarah's first New York Fashion Week show review; she is also very handy with a camera, so I'll be showing her "street shots" from Lincoln Center soon. At VLOV, despite the clichéd opening that provoked laughter from stiff lipped fashion editors (Dun dun dun… an ominous Don LaFountainesque voice spelt out the name of the line), Richard Wu’s designs saves the day. Although he was named as one of the top ten Chinese designers at Chinese Fashion Week this year, it was designer Qing-Qing Wu's (Richard) debut show at NYFW. When we were told he was inspired by the letter V, I was afraid of seeing low V neck tees on male models (is Snookie here?). Instead, sleek sport suits in muted colors paraded down the runway in gray, black, cobalt blue and white, in lightweight fabrics like nylon and distressed linen. I saw minimalistic suit jackets as outerwear with asymmetrical seams and zippers that would fit right in on the streets of Manhattan. Some designs were decidedly inspired by womenswear, including a fabulous short sleeved jacket with ruched shoulders. The real stars of the show however, were the moccasins with a cut out heel in black and gray. 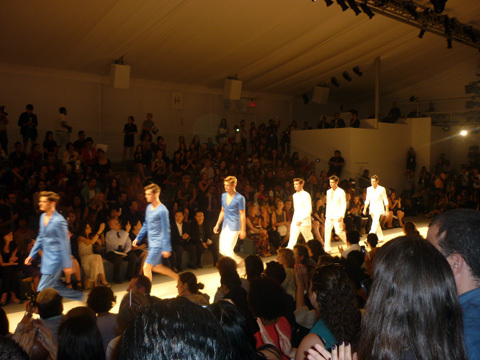 They were given some twitter love by both Ford Models and Milk Studios ( “Exclamation points in our eyes!”). Ed. note: Get a good view of the moccasins in the official Mercedes Benz video below. I will not deny that I saw exclamation points in my eyes upon viewing.